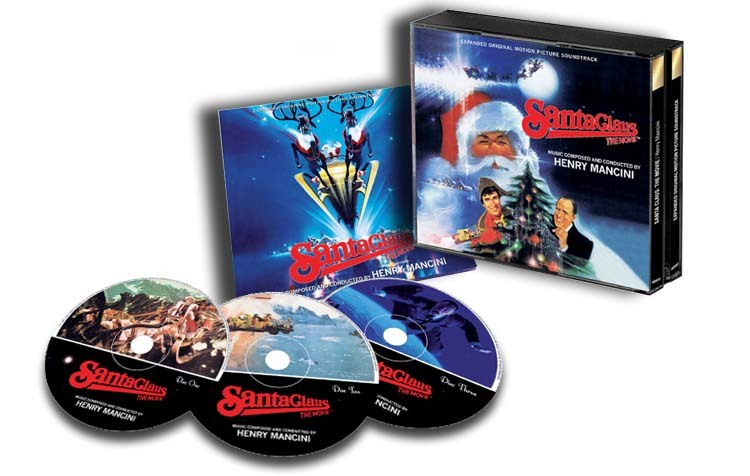 release of Henry Mancini’s complete score for this 1985 Christmas movie Santa Claus: The Movie. expensive project produced by Alexander Salkind, it was not the box-office hit it was expected to be. One of the most important aspects of the film was its soundtrack, for which Salkind hired the great Henry Mancini. The composer was deeply involved in the production, composing more than 85 minutes of original music for the 109-minute film. also features The Ambrosian Children’s Choir performing several charming songs written by Mancini and Leslie Bricusse. a program of highlights: 13 tracks lasting only 37 minutes (from an 85-minute score!). or the addition of pop elements. Almost all of Mancini’s symphonic effort was missing. extra material that Mancini recorded for the film: songs with alternate lyrics, different orchestrations, etc. generation master tapes stored in the Abbey Road vaults. This deluxe, 3CD release includes a 32-page full-color booklet with liner notes and track-by-track analysis by Jeff Bond.